Konishi Hirosada (ca 1810 - 1864) Kataoka Gado II as Inuzuka Shino, 1852. Chuban. Another of Hirosada’s inspired ukiyo-e portraits. This is Kataoka Gado II as Inuzuka Shino from the play Nansô Satomi Hakkenden. Gado plays Shino, one of eight brothers from the union of the Princess Fuse and her father’s dog Yatsufusa. Each child bears one aspect of the Confucian principle. In this woodblock print, Shino embodies filial piety, and dresses as a samurai, hence the scabbard visible in the picture. When the boys are sixteen they are sought by a palace retainer. The long and complex quest is mystical and magical in nature culminating in the appearance of a giant demonic cat and much flying of warriors and magical creatures. 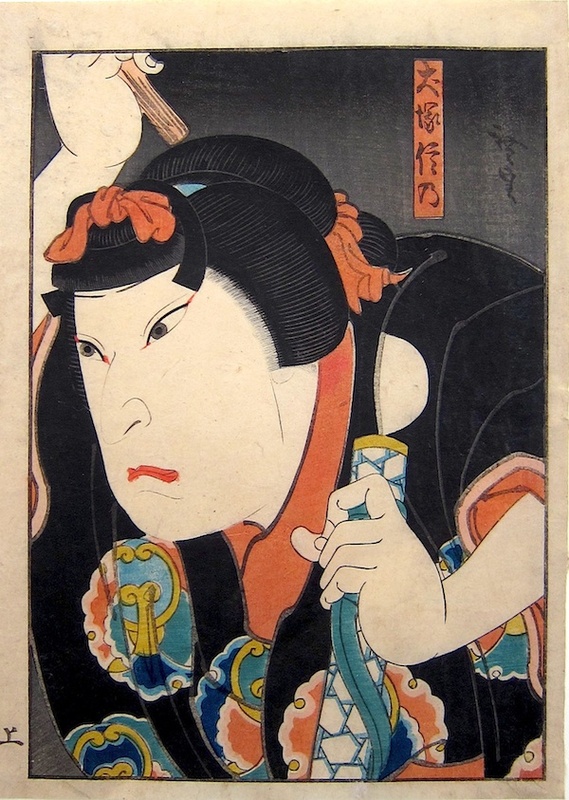 The print commemorates a performance at the Chikugo Theatre in February 1852. In this print the figure of Shino fills the frame. Hirosada manages to create space and character by the most economical means using his customary design skills to balance realism with abstract, flattened shapes. The Osaka prints of Konishi Hirosada are among the finest and most individual of the whole ukiyo-e genre. Particularly outstanding are these half length chuban actor portraits from the 1840’s. Instantly recognisable, these exquisite, complex pictures are among some of the finest character portraits produced anywhere in the world. Self contained, endlessly inventive within a tight, self imposed pictorial constraint, each picture is capable of extraordinary surprise and revelation - be it tiny details of design or technique or astonishing bold leaps of facility. Hirosada effortlessly plays with illusion, depth and pattern whilst all the time maintaining the spirit of the subject and the realism of the portrait. A fine print, full size with margins, fine colour, impression and condition.